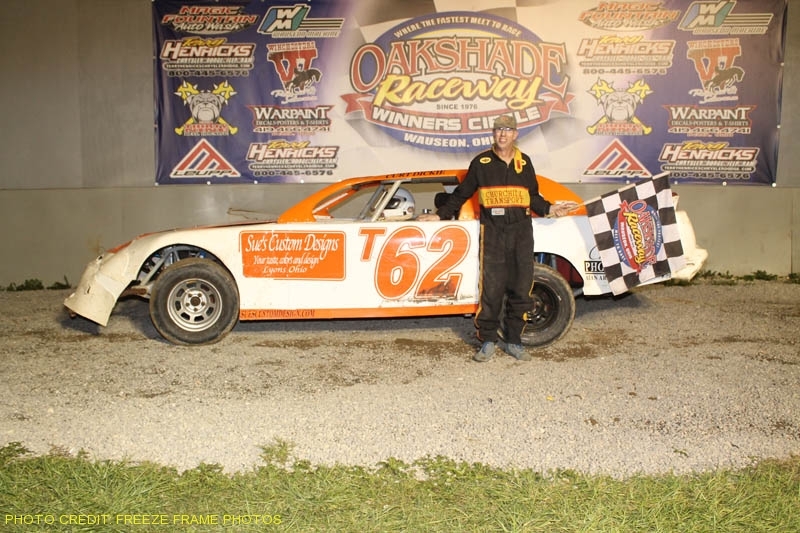 Dona Marcoullier swept down from Houghton Lake, Michigan and left a lasting impression with the Oakshade faithful and the other 43 UMP Late Model competitors, picking up the Season Championship Late Model Feature win in just his second visit to the 3/8 mile high-banked dirt oval. Rody Schroyer finished third and wrapped up his third Oakshade Raceway Late Model Track Championship title. The main storyline entering the night was whether or not Schroyer would maintain his very slim 12-point lead over Dusty Moore in the final night of point competition for the UMP Late Model division at Oakshade Raceway. Both drivers faired well in their heats with each driver getting the win to earn starting positions in the Season Championship Feature. Schroyer started three rows ahead of Moore in the feature and suffered a slight scare early on. A few cars bounced off each other on the first lap down the backstretch including Hillard Miller getting into the rear of Schroyer’s. That resulted in a complete restart with a few cars suffering damage, including that of Schroyer. Ronnie Perrine Jr. gained the initial lead after starting on the outside of the front row. Ky Harper, who was celebrating his 18th birthday, closed up to the second position and the top two drivers pulled away. Schroyer fell back through the field early in the race with Dusty Moore getting ahead of him by a few positions, but Schroyer would fight back up through traffic before the end of the race. Dona Marcoullier made his presence known on lap 19 after getting by Harper for second as he began his impressive march to the front. A top three finish for Herb Reich was negated by getting too early of a restart after a lap 23 caution. Reich’s jump knocked him back to an eighth place finish. Meanwhile, Marcoullier got by Perrine for the lead late in the race and went on to post his first ever win at Oakshade Raceway. Perrine took second and Schroyer got credit for a third place finish that put him ahead of Dusty Moore by 34 points in the final Oakshade Raceway Late Model point standings. Ky Harper finished fourth and Zac Davis was fifth. At the awards banquet in December, Schroyer will be presented with a Rocket Chassis and $7,000 courtesy of Ruhlman Race Cars, Wyse Excavating, Matt Mahnke Concrete, Raceway Energy’s, Harold & Sue Holland, Bill Ersham Concrete, Don Williams Excavating, Leo’s Metal & Wood and Oakshade Raceway. Rusty Smith looked to have the car to beat in the UMP Sportsman Feature event after gaining the early lead over Brad Mills. A series of caution periods kept the field tight in the first 10 laps of the race, including a pair of Bruce Stuart spins and a spin by Ky Harper after running up in the top five. Smith lost the lead on a lap eight restart after spinning in turn one in front of the entire field. Brian Fisher inherited the lead and went on to get his second UMP Sportsman Feature win of the year. Mike Jessen maintained his points lead over Brian and Tim Fisher with his second place finish. Tim Fisher finished third ahead of Brad Mills and Rusty Smith who recovered nicely to finish fifth. Craig Dippman started on the pole of the UMP Bomber A Main and spun early in turn two and collected the cars of Curt Lancaster and Chuck Leininger. Chris Henry was celebrating his 22nd birthday and appeared to have the car to beat, leading most of the race by a large margin until just before the white flag. Henry abruptly slowed coming off turn two and limped back to the pits. B.J. Gregory took over the lead as the white flag waved over the field and went on to earn his first UMP Bomber A Main win of the year. Jeff Foks Jr., Dustin Sautter, Jim Scout and Danny Hogrefe rounded out the rest of the top five finishers. Jim Scout reclaimed the Oakshade Bomber point lead after Henry’s trouble socked him with a 15th place finish. Scout now leads Henry by just four points with two more weeks of point racing remaining. Tyler Line led much of the UMP Hornet Feature. Adam Noonan and Dylan Burt tangled behind the leader in turn two, but both drivers managed to sort things out and continued on after dropping back a few positions. Fourteen-year-old Dylan Herman kept out of trouble and got to the inside of Line on the final lap and won a close one over Line, Gabe Mueller, Derek Morris and Curtis Spurgeon. Randy Roseman and Rick Dippman duked it out for the early lead in the UMP Bomber B Main. Roseman won that battle until Ron Bloomfield Sr. got by on lap three. Ron Leonard then began to apply the pressure on Bloomfield for the lead. A wreck with two laps to go involving Marty Bloomer, Jake Reckner and Cody Houston tightened up the field one last time. Bloomfield went on to capture his second B Main win of the year. Leonard held of Dippman to finish second with Kevin Cole and Terry Rushlow finishing fourth and fifth respectively. Randy Roseman might have had a top five finish, but wrecked in the final corner dropping him to 16th. Rick McDaniel led at the start of the UMP Bomber C Main until Jon Miller got by in the first couple laps. Miller went on to pick up his first feature win of the year with Chris Howard closing in near the end of the race. Howard had to settle for second with Nate Goodman, Ron Bloomfield Jr. and Jeff Strock the rest of the top five finishers. The Oakshade UMP Late Model point battle may be over, but those drivers will return next weekend for the final American Late Model Series event of the year which will pay $2000 to the feature winner. The Labor Day weekend action will also feature the UMP Sportsmen, UMP Bombers and UMP Hornets. Gates open at 4pm with racing starting promptly at 7pm.